Since we have been living in Morocco we make a trip to the desert in the winter. The first year was an exploration on our own. Last year, my brother-in-law joined us for a week long journey, while this year we set-off for a week with my wife’s parents for company. This time though we decided to go south via Fès and Errachidia as we have never seen this route. 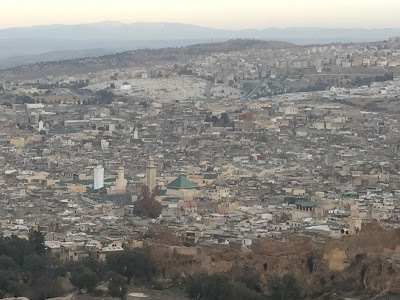 We left Casa on the 26th of December and took the highway to Fès where we first settled in our rooms, had a coffee, tea and something to eat before heading to explore the city in the afternoon. We had to head back by 6.00 pm as we were invited for dinner by some local friends. A great experience as always. There aren’t many things that compare to Moroccan hospitality. Next morning we set-off for Errachidia through the Atlas mountain. We chose the route that goes through Azrou as we wanted to see the monkeys and the Cedar of Africa. It was worth the effort as we all thoroughly enjoyed the interaction with the wild animals and the walk in the forest. The drive through the mountain was great. A much faster and similarly scenic route as the crossing through Tichka from Marrakech, this is a better alternative if one wants to visit Merzouga. We arrived to Errachidia just before sunset and experienced the chilly evening temperatures of gate to the desert. unfortunately the rooms were not heated and there was no hot water. This being the first and only negative experience in Morocco even though we already travelled extensively in the country. The following day we drove the relatively short distance to Merzouga – situated in the Sahara desert, near the Algerian border – and only stopped for tea, coffee and to provide the opportunity to my in-laws to taste the camel milk. Upon arrival we settled down in the cosy rooms and sat outside to enjoy our fresh lunch under the hot desert sun, before heading off to a 4×4 guided desert tour. 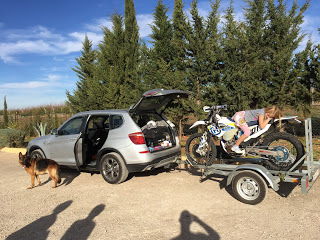 While the family and dog enjoyed the comfort of the SUV, I enjoyed being on my bike to get a taste of the gigantic playground the desert is on an off-road bike (video and pics in a separate post under Ride in Merzouga). As night temperatures are freezing this time of the year, our excellent dinner was served in a heated dining room. Sleep caught us early that day. I woke up early the next day to see the sunrise and take a walk with the dog in the dunes. After breakfast we headed back to the dunes – this time on camel back. This must be on one’s bucket list and is definitely something to experience. Although not very comfortable, the quiet and beauty of the desert is comparable to nothing else. Once back to our riyadh, we packed our gear and took off to the next destination of our road-trip: the Dadès valley. We have been there last year and beside the breathtaking scenery and the calmness of the valley, the area provides many wonderful treks to explore. Our hosts were very nice and friendly (as usual in Morocco) and prepared a wonderful dinner. Next morning we followed Brahim, our local guide into the valley on foot to is it a spot called „monkey’s fingers“ (les doigts du singe). The path winds through crops and goat treks and follows the river. The dog entered the freezing water on multiple occasions and seemed to enjoy it – as he did last year. On our way back Brahim saw me taking a picture of the mountains in the background and pointed out that I shall see a face if I turn the picture 90 degrees clockwise. And it is indeed a face 🙂 As a comparison, the picture I took the evening before with the shows and the sun still lighting up the nose, and the picture I took in the morning. Our next stage was rather short as we headed to „Les Tourmalines“ – a B&B situated by the lake about 20 km from Ouarzazate – a familiar place for us. The owners greeted us warmly and we set down for some bite and beer under the hot sun. We then drove into Ouarzazate for a walk to show the city to my in-laws. The following day was December 31st. Before leaving Casablanca, I contacted a friend (Peter J. Gray) I met at last year’s Paradis Plage beach enduro race. A guy from Newcastle who moved to Ouarzazate with his wife many years ago and has a good knowledge of the dirt roads in the area. Luckily Peter was available and willing to show me around so I avoided having to explore the tracks on my own – something much less enjoyable and more dangerous. 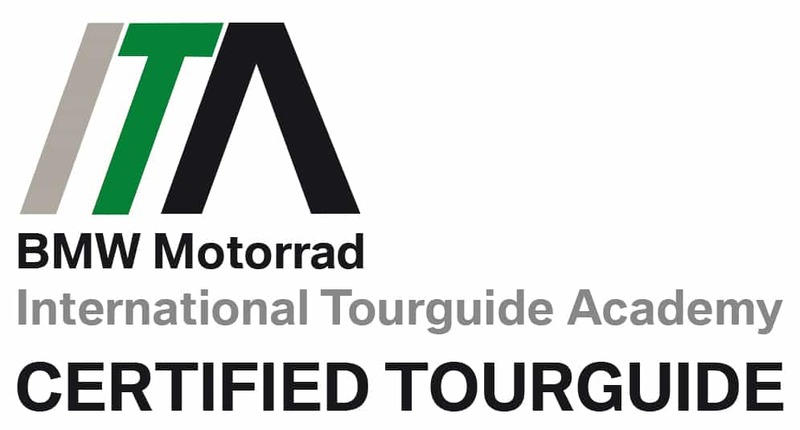 I created a separate post about the ride that you can access here: Ouarzazate ride. I must thank Peter as I spent a great day out there. in the meantime the family visited the Kasbah in Ouarzazate and the film studios. We met up in the afternoon at the hotel and spent the time playing board games and enjoying the sun. New year’s eve caught us in the bar where we chatted around with the owners before returning to our rooms under the umbrella of the countless stars on the clear sky above us. The last day of the trip was less eventful. As usual, the trip was long and we spent almost 8 hours on the road before returning home to our cosy beds. Crossing the Atlas through Tichka is beautiful but the hairpins and small roads only allow for a low average speed which makes the journey rather long. Overall we have spent a great holiday as usual, thanks to the Moroccan hospitality and the wonderful scenery this country has to offer. We spent more than 26 hours on the move and covered 1810 km throughout this trip. As part of our South-Morocco tour, we planned to spend New Year’s Eve in Ouarzazate. Or near. We usually stay 20km from the city, at the border of the lake, in a family run B&B named „Les Tourmalines“. A quiet, wonderful place. Before leaving Casablanca, I contacted Peter, a friend who lives there and operates enduro tours in the region to hook up for a ride. Luckily he was available and willing to show me around so we agreed he’d pick me up on the 31st at 0900 and we’ll leave from Tourmalines. After a quick coffee we headed west on tarmac, to then turn south into the desert and towards the lake. The terrain was great, starting in a riverbed that allowed for high speed with some occasional technical bits, then turning into rocky speedy sections until we climbed to the hill surrounding the lake. We longed the water and our path included technical descents and some climbs through the rocky terrain that was sometimes longed by savanna-like grass. We then arrived to Ouarzazate and turned south towards the Fint oasis. I’ve been there a couple of weeks before on my bike but I obviously took the known road, while Peter now showed another path that got us to the valley from the other side so we could cross the oasis. The into the valley was a well-flowing speedy „piste“ that I greatly enjoyed. Once in the valley we had to cross the river a couple of times and had to choose our way as there was no defined path in some sections. It was a great fun. We returned to Ouarzazate from the other side of the valley and went to Peter’s HQ. He showed me his workshop and we chatted around, then had lunch and coffee in front of the workshop. As Peter is also the importer of Motoz tires, I got myself a new rear tyre that his mechanic was kind enough to fit while we ate. Leaving him to prepare for the evening party I headed back to the family, but as I didn’t fancy 20km on asphalt, I wondered off to some unknown dirt roads that sometimes led the wrong way. I gave me the opportunity to test the tyre and to explore the area. I’ve uploaded below a short video of the ride, the map and trip data as well as some pics. Enjoy. Thank you Peter for the ride and happy 2016 to all! For this year’s Morocco winter trip I took the motorbike on a trailer to explore some of the sites we were visiting. When in Merzouga, we hired a guide as usual to take the family to the dunes and the surrounding sites. I used this opportunity to take the bike and ride in the desert planes and the sand dunes. It is a fantastic experience that everyone should do once. Here I share a couple of pictures and a short video, I hope you enjoy.